Hansie seemed to start the trend, when a surprised South African public heard that he would be playing for Ireland in the Benson & Hedges Cup. It turned out to be the first step in really getting Ireland into International Cricket. Cronje played 3 games, scoring 2 fifties and also chipped in with 6 wickets. 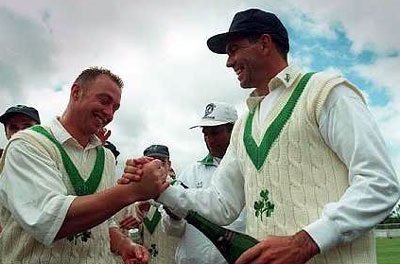 Ireland won a game thanks to Cronje’s 94 unbeaten and it was already a successful experiment. In 2006 it was the turn of the Pakistani’s to join in with the Irish. 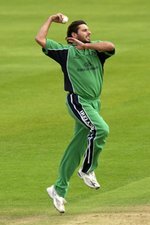 Boom Boom Afridi played 6 games in the C&G Trophy for Ireland and scored 128 runs, frustratingly only passing 50 on one occasion. He also produced distinctly average bowling displays taking only 7 wickets for 148 runs. But he did produce a brilliant display in taking 3-4 in eight overs against Gloucestershire in Ireland’s one and only win in the season. Being able to get the Australian Captain on board just after the South African captain was a major coup for Ireland. The Aussie captain actually featured for the Irish as a guest in a series against Australia “A” featuring many players that were pushing for a place in the World Cup Squad. Steve Waugh scored 246 runs, two half centuries and averaged 35.14 but did a whole host of good in promoting the game of cricket in Ireland. While Jesse Ryder was drinking, Nantie Hayward was working hard to help Ireland avoid utter embarrassment. He unfortunately provided average resistance in the bowling, for while he picked up 7 wickets, he still went at a run-a-ball throughout the tournament. The Saffer was unable to help Ireland win any of their 6 completed games as they finished bottom of the South Division table again. Johnson played 3 games for Ireland in the B&H Cup, he knocked one 50, but otherwise did not feature with the bat. He also struggled with the ball picking up only two wickets, but none of that would matter when he starred for Zimbabwe in some memorable knocks. Before the days of drinking and fighting, ag, who am I kidding, during the early days of drinking and fighting, Jesse Ryder also joined forces with Ireland, obviously spurred on by his love of the Irish Car bomb. Ryder played only two games for Ireland scoring 3 runs, he also only bowled two overs in the season. His time in Ireland was more infamous for the time when he just didn’t pitch at a game, probably thinking it was still evening at the pub. Ravi did no damage to his own reputation as he played for Ireland in the 2008 Friends Provident Trophy (The old C&G Trophy). He was the leading wicket taker for Ireland picking up 10 wickets at an economy rate below 5. His bowling played a big part in helping Ireland win a game in the trophy for the first time in two years. 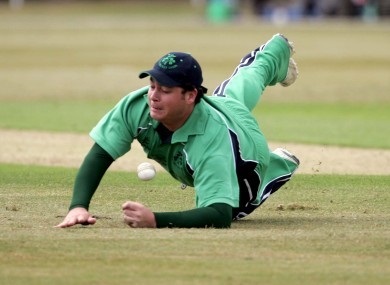 Johan Botha represented Ireland in the C&G Trophy in 2005. The Journeyman of South African cricket went to go and help out in Ireland but ended up playing only 1 game and producing distinctly average performances with bat and ball. He scored 18 runs and took no wickets for 37 runs. I can find no reason why he only played one game, but it was forgettable all round. Jonty was third in line to play for Ireland as a guest following the examples of Hansie Cronje and Steve Waugh. Jonty played for the Irish in two 3 day games and four Limited overs games against a South African Academy side featuring Andre Nel, Ahmed Amla, Gulam Bodi amongst others. The LO series was tied 2-a-piece, but Rhodes faltered scoring only 42 runs in four innings. He was better in the 3-day games as he scored 199 runs with two half centuries and took four catches. Although stats don’t show it, you can bet he picked up spirits with some great fielding. 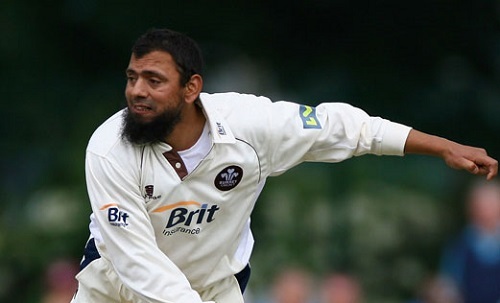 Saqlain Mushtaq played alongside his countryman and friend Afridi in 2006, but produced poor figures throughout the tournament. He took only four wickets in the C&G Trophy and was a costly 5.27 runs per over bowled. He definitely preferred playing in darker green!